I’m a web designer, former graphic designer, writer and, like most of us these days, general internet addict. Which means that while I’m browsing hundreds of websites a week, I’m also critiquing and assessing them at the same time. It’s a double edged sword, no doubt but I’ve picked up a thing or two. And I’m going to share with you the top 10 elements essential for a successful small business website. Easy on the eyes, a clear navigation menu with the main sections of the site, a picture or two for colour and flavour, the heading or name of the site. It’s quite simple really. I can’t stand cluttered websites that are full of ads with double sidebars and everything screaming for individual attention. I’m still surprised at the number of sites that use a black background and white font. It’s incredibly hard to read and I usually give up. So too, use a common sans serif font for your body copy and a different font for your headers. Go simple and your readers will appreciate it. Your homepage serves as a quick representation of your whole business. Think about that in the design, layout and content. State your purpose up front and centre. Be concise. Two things should be immediately apparent - your business name and what you do. Don’t let anything obstruct or obscure that message. Each page of your website needs to serve a clear purpose. Keep your copy clear and to the point. Don't go above 700 words per page and use headings to draw the reader's eye and stay on topic. Don’t ramble and keep in mind the aim of each page. I could talk about the benefits of blogging till the cows come home or I can just quote you some stats. 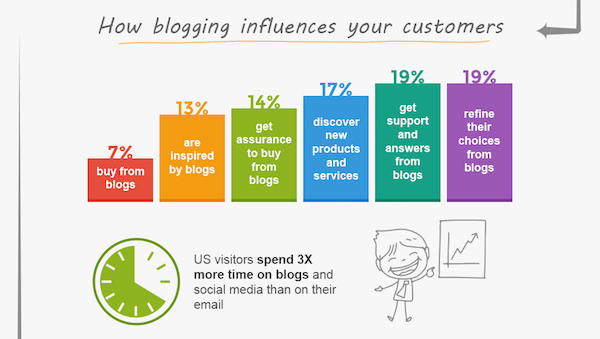 If you’re a business, blogging is an awesome way to connect with your audience, build trust and demonstrate your expertise. This is particularly relevant for information-based websites or blogs. Some people will visit your site to browse and are happy wandering around. But others have a particular question in mind and want it answered quickly and efficiently. A clear navigation or menu bar up front can guide the way. Provide readers with as many ways to contact you as possible; don't make people search for them. Some of your audience prefer email over phone calls but give both options where possible. It’s the digital age and if your business isn’t on social media, that’s a whole other issue. But even if you’re only on one or two platforms, put those links up front and centre. An active social media platform inspires confidence in your small business. So, fill out your profiles properly and get pinning/tweeting/posting! A Twitter account that hasn’t had a post since 2014 is not going to inspire anyone to stick around. Not only is Google now penalising sites that are not responsive, your readers will. I, for one, will not stay on a page trying to read a tiny font on an already small device; it’s a real turn off. If your site isn’t already responsive, make this a priority before your SEO ranking drops off the search engines altogether. Branding is what identifies your business from the rest of your competitors. It signals professionalism, trust and recognition. Typically, branding consists of your logo, headshot, fonts, colours and style. This doesn’t mean that it needs to be fancy but it does have to be visible and consistent, and that means using it across all your digital and print mediums. I hope this has given you some inspiration and help for your new or improved website. If you have any other tips, please leave them in the comments! About the author: Lilani Goonesena is an Australian freelance writer, Squarespace web designer and blogger currently based in Vientiane, Laos. She loves helping freelancers and small businesses get online with web design and content, blogging and her awesome weekly newsletter on digital marketing, social media, blogging, web design and "all that online stuff". 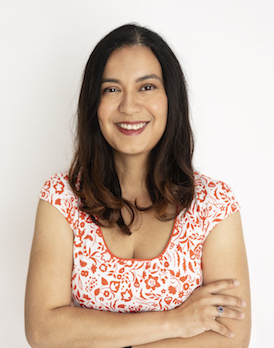 She also writes food and travel articles for businesses and magazines, and blogs at the delectable Eat Drink Laos.